Hello, and welcome to May's Beauty Wishlist! I can't believe it's May; where is the time going?! You might be able to distinguish a theme for my beauty wishlist this month - sun! We had a little taste of summer in April, and hopefully that's not the last of it for this year. This month is very much about prepping for the summer! The first product on my list is the Isle Of Paradise Self-Tanning Drops in Medium. I've heard so many good things about Isle Of Paradise products and these drops in particular. I'm desperate trying to get rid of my pale skin ready for the summer, so I think I'll give these a go and see how tanned I can get! 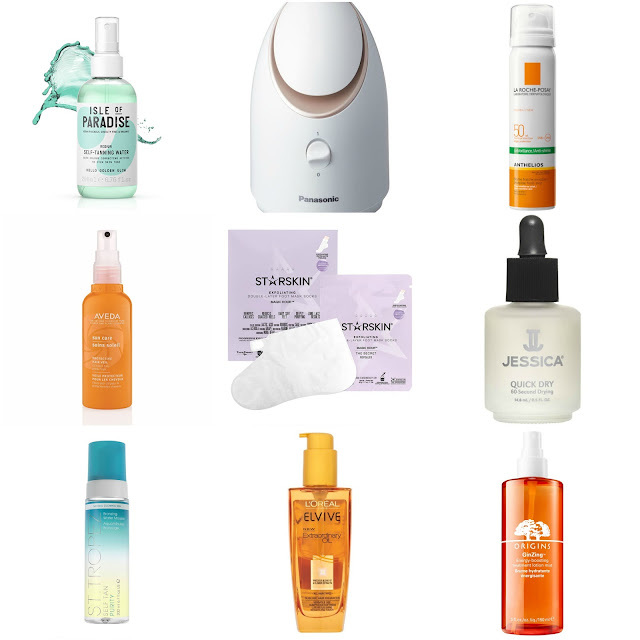 Talking about prepping for summer, although this is something I'd use all year round, I've included the Panasonic Facial Steamer EH-XS01 in my wishlist. I've been wanting a facial steamer for a long time, but I've never seen one which I've wanted. This will be perfect for ensuring that my skin is in tip top condition! Being safe in the sun is a must, I really need to start wearing an SPF every day to make sure that my face is protected against harmful rays. My SPF of choice is the La Roche-Posay Anthelios Invisible Face Mist. I love the sound of this one because it's a mist, so hopefully it shouldn't be heavy on my skin. Something I don't normally think about when I'm in the sun is protecting my hair. I've found the Aveda Sun Care Protective Hair Veil, which looks amazing - this will keep my hair healthy whilst enjoying the sun. Now, I know a lot of people don't like feet, however, getting your feet ready for the summer is just as important too. I've seen a lot of people using foot masks recently and say how good they are, so I definitely want to give one a go! I like the look of the Starskin Exfoliating Double-Layer Foot-Mask Socks. I have a real problem with smudging the nail polish when I paint my nails, however, there is a product that can help with that! Apparently the Jessica Quick Dry Drops sets the polish in place so there's no risk of smudging your nails. Back to tanning, and something that I hadn't thought of was my face. It seems a bit strange to tan your body, and not your face? I would never use the tan that I use on my body on my face, so the St Tropez Purity Bronzing Water Face Mist looks a good option! I'm nearly running out of the OGX Argan Oil that I've been using, but I've heard lots of good reviews for the L'Oreal Elvive Extraordinary Hair Oil, and it's a product that I've been wanting to try for a while now actually, so I think I may have to pick myself up some when my OGX finally runs out. Last but not least, is the Origins GinZing Treatment Lotion Mist. I love the scent of the GinZing range, but the treatment lotion isn't a product that I've seen before. I was very intrigued by it, so it just had to feature on my wishlist! I want to try some of the Isle of paradise stuff- they sound great. I love the Origins Ginzing race - that moisturiser smells so good! So I think I've got to add the lotion mist to my wishlist too.